Click here to visit the online store and purchase your own copy! 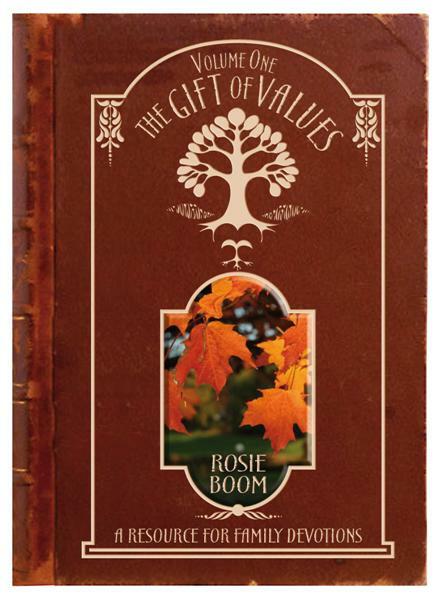 The Gift of Values ~ Volume One was released on June 23 2006, and has more recently been published by HSM, Australia in a hard back edition, brown leather-look with gold hot foil printing. 149 pages. It is the first in a series of four books, with each book covering six different values. Once Upon a Time - stories that demonstrate some aspect of the value being studied. Think About It - questions you can ask your children to get the ball rolling. Boom Clips - personal glimpses into the Boom family! Something To Do - practical activities which will reinforce the particular value. So Said – inspirational quotes that you can use to stimulate discussions with your older children. Words To Live By – verses from the Bible. Dig Deeper - suggestions for further reading, and DVDs and movies to watch.